The typical quick and natural go to snack prior to a morning work out has always been the trusted banana. But as of late I have got something of an obsession with papaya and it has now become my preferred choice of morning snack. Not as sweet as some fruit, its main appeal lies in the delicious combination of exotic and colorful. Especially when waking up on a grey March morning. It is simply put a fruit that reminds you that there is sunshine ahead – a promise of better days. 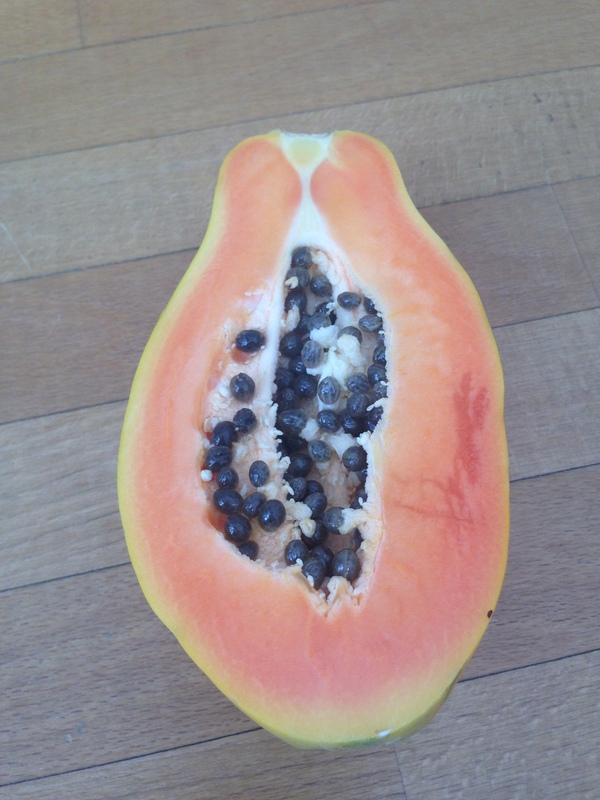 In my trusted book ‘Natural Wonderfoods, 100 amazing foods for healing, immune boosting, fitness enhancing and anti-ageing’, it says that papaya is filled to the brim with anti-oxidants as well as valuable enzymes to heal inflammation and aid digestion. It is a mild diuretic and apparently expecially good for sorting our children’s urinary and digestive ailments. On top of that it is also a great source of Vitamin C, B, Beta-Carotene, Folic acid, Calcium, Iodine, Iron, Magnesium, Potassium and Zink. Apparently you can even use it on your face as a mild exfoliant to brighten and rejuvenate skin!! Who knew? Puréed papaya was the best thing when Gut was younger and was going through a with-holding stage. Worked so well. And I had a similar phase with Sophia – was recommended loads of chemical stuff that really didn’t do the trick. Should have known back then what I do now…. Yes. I did the same. It wasn’t until a lovely osteopath recommended it that I tried it. Loving your blog by the way. So interesting.